It was gathered that Rev. Fr. 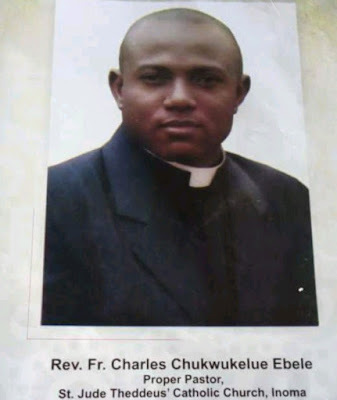 Charles Chukwukelue Ebele (pictured above), the parish priest of St. Jude Thaddeus Catholic Church, Inoma, Anambra State, and his friend were in a boat journeying through the River Niger yesterday when the sad incident happened. According to Azubuike Okwuotu Imoka who shared the sad news on social media, as the boat was about to capsize, Rev. Chukwukelue took off his life jacket and gave to his friend. He drowned before help could come when the boat eventually capsized. Such a rare human. May his kind soul rest in peace. Amen!